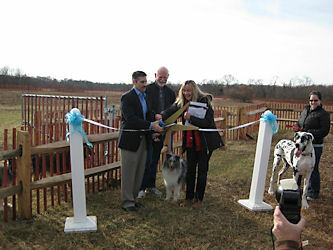 A large, new dog park is now open at the former Robinson Duck Farm on Montauk Highway in Brookhaven Hamlet. 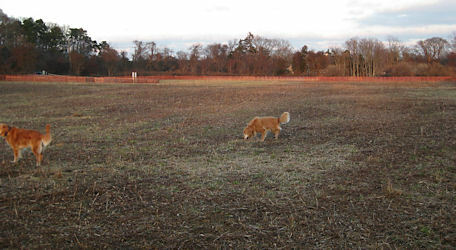 The dog park, which is located in the north central portion of a multi-acre field, currently covers 2.6 acres and is surrounded by 4-ft. high wooden-slat snow fencing. There are two DOUBLE-gated entries into the dog park off a small parking lot. Because the dog park is located adjacent to Montauk Highway, dog owners are advised to keep their dogs under control and under close supervision at all times. As a “natural borders” dog park, the park will not have the usual amenities associated with more traditional fenced dog parks. Dog owners are expected to bring their own waste disposal bags and water. Moreover, the County is not providing trash receptacles or waste removal at this time. LI-DOG has asked the Parks Dept. to provide those services to the new dog park. County Executive Steve Levy, county.executive@suffolkcountyny.gov or 631-853-4000. Suffolk Parks Commissioner John Pavacic, scparks@suffolkcountyny.gov or 631-854-4949. On Dec. 9th, members of LI-DOG and their dogs accompanied Leg. 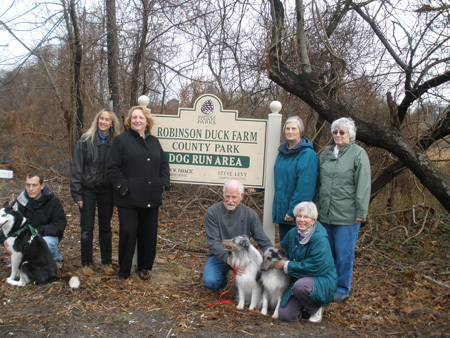 Kate Browning and leaders of the South Yaphank Civic Association for an inaugural visit to the new dog park at Robinson Duck Farm. The South Yaphank Civic Association has been an invaluable partner in helping find a good location for a dog park in the area. Leg. Kate Browning has worked since 2006 to create a dog park for her constituents and is the author of legislation that would create a dog park in Southaven County Park. That off-leash area would be a traditional dog park with chain link fencing and all the amenities associated with such facilities including benches, water, waste bag disposal stations, access to bathrooms, access to shade, and substantial parking. 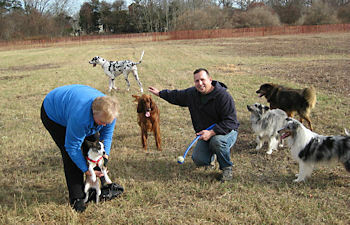 Suffolk County officials, however, estimated the cost of a dog park in Southaven County Park at more than $70,000. On December 14th, at the same time as he cut the ribbon for the new Robinson Farm Dog Park, Suffolk County Executive Steve Levy vetoed the Southaven Dog Park bill, saying that in tough economic times, the County needed to come up with an alternative. The dog park at Robinson Duck Farm with its snow fencing and minimal services fit the bill. It cost only $6,000, according to the County Executive. LI-DOG and the South Yaphank Civic Association will urge the County to add more parking and expand services and amenities at the dog park in the coming weeks and months. Dog owners who came to the ribbon cutting also were very happy. Several noted they’ve been waiting for a dog park in the area for years and that instead of driving miles to other dog parks in Suffolk County, they welcome this big, new dog park in their community. Again, please let us know what you think by emailing us at lidog_news@yahoo.com.